The White House Tavern was our last meal in Aspen, and boy did we go out with a bang! We sat at the bar with Tyler and a full view of the open kitchen. Although this was only half of the kitchen, as the other half is in the back, we were still able to see a lot of the exciting action. Tyler started us off sharing a local beer on draught, while we decided what to have. Once he told us the special was a version of a reuben, we were sold. We just had to decide if we wanted to have the super popular chicken sandwich or a burger. I do not eat burgers very often because I like to have my burger rare or medium rare and sometimes it is hard to find a place that you can order this way. When I told Tyler this, he said “Go with the burger!”, so we did. 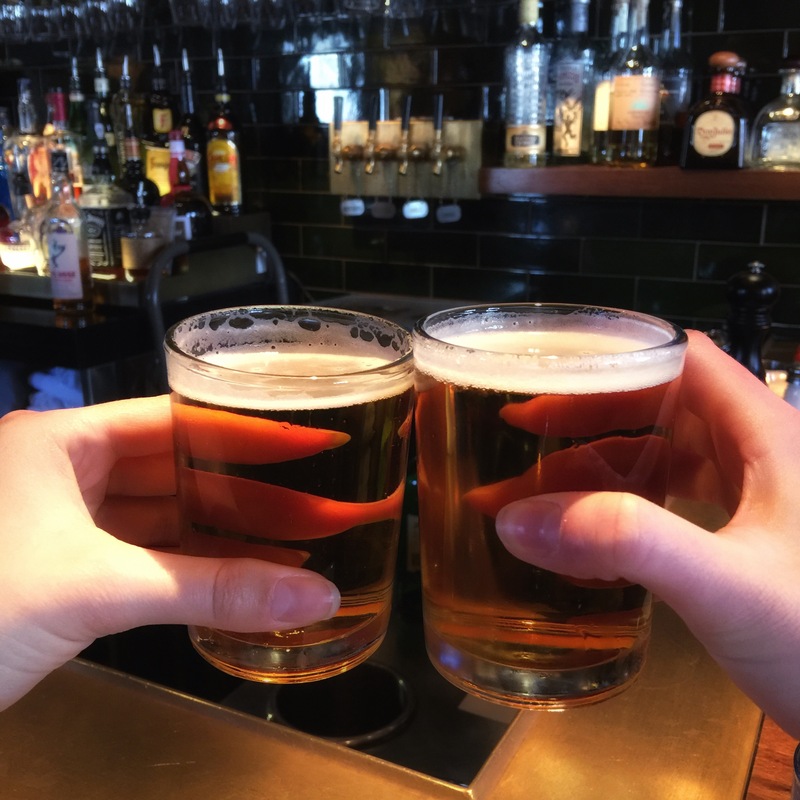 We sipped our beer, which was really good, and toasted to a fantastic week in Aspen. 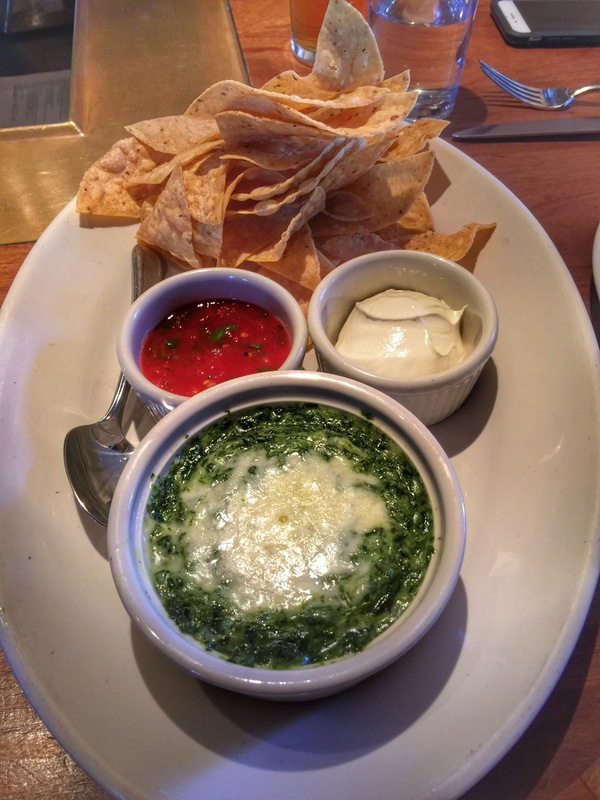 We had the spinach and artichoke dip as an appetizer, which was a no brainer since The White House is a Hillstone restaurant, just like Houston’s was in NY. It is served with warm tortilla chips, salsa and sour cream. The dip is creamy and cheesy and was gone in under eight minutes. It had been a while since we had been to Houston’s, so we truly missed this dip. As we waited for our sandwiches to come out, we were brought a basket of french fries to nosh on while we watched the chefs prepare various meals. The setup was really cool. There were two grill tops and a double basket deep fryer in the middle of the bar area, as well as a prep station opposite them. There were two chefs working non stop grilling, frying and prepping food. They had a few refrigerator drawers under the flat tops that stored most of the meat and ingredients to bread or prepare any of the grilled dishes on the menu. The french friends were deep fried and tossed in a copper bowl with a sprinkle of salt, then sent off to the tables. All the bread is made in-house, which completely transforms the sandwiches into unforgettable delicacies. 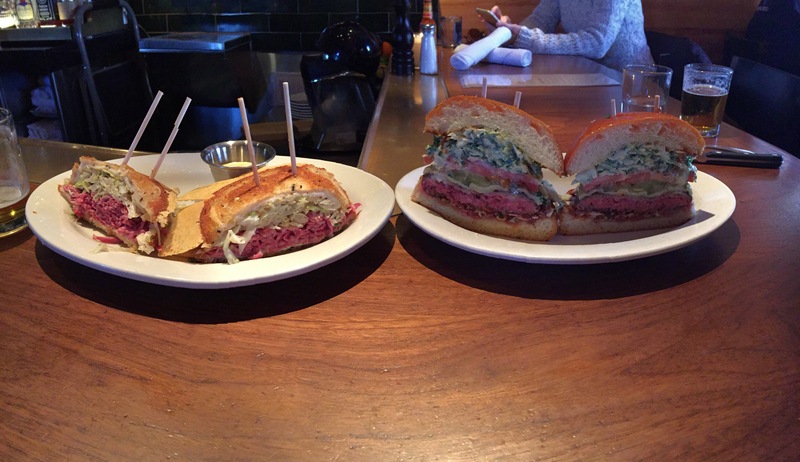 When our burger and sandwich were brought over, our mouths dropped. Not only from the deliciousness, but also from the size of the burger alone. The reuben came out as a normal sized sandwich with moist and flavorful pastrami, house-made cole slaw and melted cheese. It was served with a “boston style” mustard. This creation was a little different than your typical reuben because of the substitutions of sour kraut with cole slaw and thousand island dressing with spicy mustard. However, this sandwich really worked and was so satisfying. If this is the special of the day…order it!! The honor burger was MASSIVE! It was about a 2 inch thick patty piled high with spicy slaw, tomatoes and white cheddar cheese. We ordered it medium rare, but I recommend going rare. It was so incredibly juicy and the flavors blended so well. The slaw was not super spicy, it had some spices, but not much heat to it. We didn’t want either of these sandwiches to end and took some home with us to enjoy during our layover at Denver Airport later that day. Although The White House Tavern is open for lunch and dinner, we feel that this is a better lunch spot than dinner. The menu is mostly sandwiches, salads and shared snacks, but everything is so good. This is another must try when in Aspen and if you can only make it for dinner, still go and have the burger!! Next PostLet the adventures begin! !